The United States is a country built on immigrant communities. Current estimates show that New York State’s foreign-born population is 22% with New York City at 30%. The most vulnerable subgroups of these immigrant communities are women and children. They have come to the United States to escape extreme poverty and violence, often with minimal resources. Many of these immigrants have experienced traumatic events either before migration, during, or once here. As providers serving these communities, it is crucial to understand the overlap of Trauma and Immigration. This webinar will explore trauma among immigrant communities. 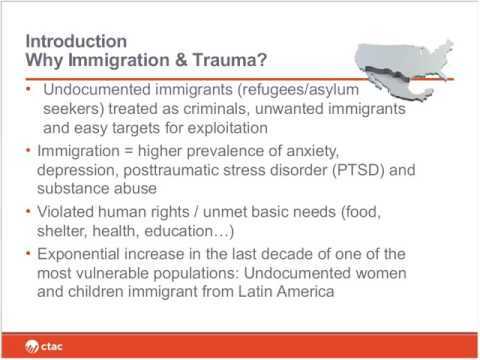 It will cover basic concepts on trauma, its symptoms and diagnosis, clinical implications for providers and impact on clients before, during and after exposure to potentially traumatic events specific to immigration. The content will be illustrated through the lens of extremely disenfranchised communities such as women and children from Central America.